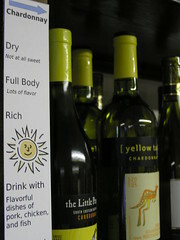 To help you find wines you'll enjoy, I've posted simple new shelf signs. Level of sweetness. From really sweet to very dry. Amount of body. Wines range from light body that is very easy to drink, through full body with lots of flavor, to very full body with intense flavors that can be a challenge! Summary. Each variety has a one-word (ok, sometimes a two-word) summary. We chose words like floral, fresh, crisp, rich, luscious, fruity, smooth, and spicy to describe the wide range of flavors in wines. I even found little clip art pictures to help you imagine the flavors before you buy. We also included some suggested food pairings and whether or not to serve the wine chilled. Dry. Not at all sweet. Full Body. Lots of flavor. Drink with flavorful dishes of pork, chicken and fish. 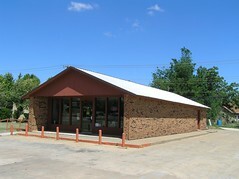 I'd love to have your feedback, so stop by when you are in Alva, look over the signs, and let me know what you think!